When I was at university in the 1990s, my fellow students were always going on strike in solidarity with one cause or another. Even though I would generally share the same political beliefs, I never saw the point. Mine's was a fundamental problem with students not going to the lecture theatre - how can you withdraw your labour if you don't actually work? It was only much later that I had a Damascene moment, when I heard how much hope people experiencing oppression in Palestine or Chile took from these actions of students who were unlike me. I realised that symbolic strikes could make a difference. In the intervening years industrial action by adults has become an increasingly rare occurrence while our children are starting to organise and take action. Anger over climate change brought an amazing 1.4m school students in 2233 cities and towns in 128 different countries out of their classrooms and onto the streets on March 15, and these genuinely held beliefs deserve far more respect than the sneering commentators who call the pupils 'fundamentally wrong' and 'misguided', implying the pupils had been tricked into missing their education through a belief in a fake crisis. It reminds me of Tour de France cyclists striking after the death of Italian rider Fabio Casartelli in 1995. Distraught, the rest of the peloton wanted to abandon the following day's racing but the organisers insisted the next stage went ahead. In protest and in mourning, the riders rode in silence but did not compete. Rather than getting respect this powerful demonstration deserved, race organisers said they were simply tired and needed a rest. Others have suggested the demonstrators could have marched on a Saturday, completely missing the point; a weekend protest would lose the symbolic power of their action. And, while not wishing to make a generalisation about one and a half million individuals from five different continents, it could be suggested that students who care about the environment come from the 'nerdier' end of the classroom spectrum; the type who normally come into school even on the last day of term. Undoubtedly there would have been a percentage who couldn't care less about the planet and just wanted to bunk off school but I imagine they will have learned that even the most boring day in school is better than marching for hours for something you don't believe in. Furthermore, in my secondary classroom experience, the work we do tends to fill the time available. Missing one hour from a week's worth of lessons means that something might have to be dropped or something else crammed in a little more quickly. Every day school business; assemblies, photographs, injections, take time out of the working day without any great sense of outrage from our political commentators. And of course students are learning how to organise a protest, stand up to power and the threat to our environment. I've worked in schools where pupils have sporadically put together well organised and clearly argued protests over a number of issues, from compulsory school uniforms to getting lockers. And generally the school management team will listen, put the pupils' plans to consultation and then kick it into the long grass. tainting the pupils experience of democracy and making them cynical about challenging authority. 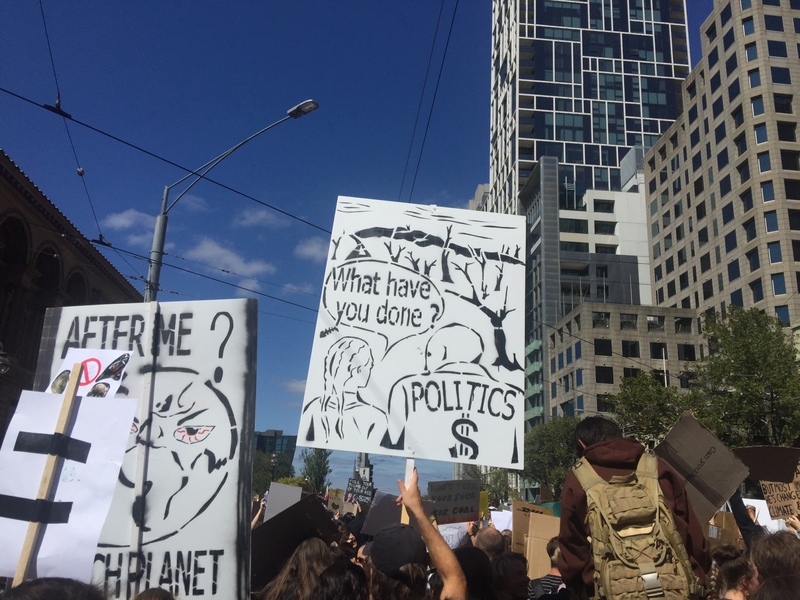 This climate change strike will hopefully redress the balance and inspire future citizens to question those in authority.